Last weekend I was finally able to sit down and watch The Social Network - a movie with a story that has piqued my interest since I saw a preview some time ago. Perhaps I was merely struck by an eerie rendition of Radiohead's Creep. Nevertheless, I was even more compelled when the screenplay became nominated for an Oscar...and isn't it time that I finally see a movie with some depth? Apparently! Cuz I can't seem to quit thinking about it. While there were many aspects of the movie that I admired - the soundtrack, the clever dialogue, the intricacy of the screenplay, great acting - what I loved most is how the movie reflected the terrifying and wonderful experience of college-youth. 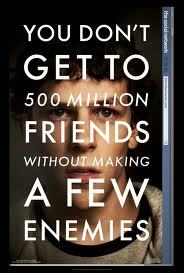 No matter if you're the brilliant outcast who would someday develop Facebook. Well, he's not much of an outcast anymore. And by the end of the movie, Mr. Zuckerberg (youngest billionaire in the world) didn't seem to care about "fitting in" anymore. I think we all learn that lesson eventually - but most people would agree that Mark Facebook Zuckerberg has had a far more interesting journey than most of us. Oh sure, The King's Speech swept the Academy, but I wouldn't let that stop you from seeing this movie! (Not sure if the Oscars sway you or not...) And no matter your opinion of Facebook - it's a game-changer. And it's origin is quite intriguing.